Continuing our support of Tasmanians recovering from the fires (and don't worry flood-affected Queenslanders and now those in NSW, you're next! ), as you know, together with Tourism Tasmania we are inviting you to visit Tasmania. It's time to book that ticket and get to Tassie to see what everyone is raving about, from MONA in Hobart to Binalong Bay on the East Coast, the Huon Valley to Stanley on the North West. It's time to get Tassie off your bucket list and onto 'places I've been' (and loved!) Read on for some fab reasons why.... take advantage of these exclusive subscriber-only offers, and do it soon! Autumn is the perfect time to visit Tasmania – a gourmet paradise with a blossoming gastronomic scene that will tempt, delight and indulge your senses. Tour the island and immerse yourself in a palate of rich autumn colours, the excitement of harvest time and the passion of small producers – there are farmers' markets, vibrant festivals and events dedicated to celebrating island produce, microbreweries and distilleries, farm gates and roadside stalls, stylish vineyards, hands-on culinary experiences, gourmet walking tours, hot-right-now dining experiences, acclaimed cooking schools and more. It's no secret that Tasmania has a new level of sophistication based around gastronomic, cultural and artistic endeavours, set amongst breathtaking scenery and a rich history which only adds to its charm. Rocco Esposito and Curly Haslam-Coates stole the show in last month's newsletter, with their takes on Tasmanian wines. This week we hear from local foodie Paul County, the name behind Tas Food Books, a publisher which has brought us many lovely titles over the past few years. We've also started a collection of Tasmanian recipes for you to enjoy while planning your vacation! PS don't forget that Matthew Evans is back on SBS on Thursday 14th March with the third series of Gourmet Farmer. Thinking about travelling to the island state to find out first hand what all the fuss is about? These tempting accommodation offers might just get you booking instead of dreaming! Event organisers and marketers (including those in New Zealand! ), you can quickly and easily list your food and wine events on our calendar for FREE. To reach our subscribers, simply go to VisitVineyards.com/MyLogin and enter your event details. When you visit Tasmania (as we hope we've convinced you to! ), you might need a couple more inspirational and helpful books to help guide your touring. Or try different way to travel the North East Valleys of Victoria. When you've done touring Bruny, stay on for a few more days and enjoy the tastes and scenery of the Huon Valley, and find out why world-renowned chef Tetsuya Wakuda makes it his retreat. 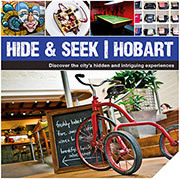 Tassie and Victoria feature this month with your chance to win superb cool climate wines, sumptuous cookbooks and more. Winners where are you? We still have some prizes on our shelf looking for their homes. Check our winners' page to see if one of them is yours. If you carry a card from any of the major motoring organisations – RACV, RACT, RACQ, RAA, RAWA or NRMA – you can enjoy warm welcomes and savings at selected wineries and producers in Victoria, Queensland and Tasmania. Here's a small assortment with links below to the full listings. We love connecting you to the growers and makers of Australia (and New Zealand)'s fabulous food and wine. Increasingly, farmers around the world are being squeezed by supermarkets, hit by extreme weather events, adverse exchange rates – you name it, they seem to cop it. VisitVineyards.com exists to help bring their stories to you, so that (we hope) you can support them when you buy, and help them weather these storms. Because unless we all do, many will leave the land, and the end result for us and our children will be fewer choices, and less healthy food. Having seen first-hand the conditions in parts of Asia where some of our imported food originates, believe me, we're all better off paying a few cents more for local produce, especially if you are also concerned with the environment. As I said to someone only this morning, it's your choice: pay the farmer, or pay the doctor.... and having been through what we went through health-wise in 2012, I know what I'd prefer to do. Cheers and good health from Robyn, Kerry, Laura, Andrew and the rest of the VisitVineyards.com team. VisitVineyards.com, PO Box 488, North Hobart. Tas. 7002. Please include price information and tasting notes, and food matching suggestions and recipes if you wish. Winepros Archive is a collection of articles and tasting notes by the late Len Evans, James Halliday OA and others, covering Australian wine and more to 2005. We keep it going as a piece of the Australian wine industry's history, and a service to wine lovers. Great if you want to look up tasting notes for an older bottle of wine, or to find out if it's past its drink-by date! © Visit Vineyards® Pty Ltd and Winepros Archive 2013. All rights reserved. All images are © of their respective Copyright owners and are used with permission.